The Jetgauge Fuel Scale from Jetboil is for anyone who wants to get the most out of their fuel. No more shaking your gas canister to guess how much fuel is left. 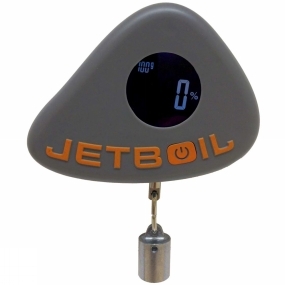 Simply hang your JetPower fuel can from the device and it will automatically calculate how much fuel you have left and then displays a simple clear percentage on the easy to read digital screen. You have plenty of things to worry about before a trip, how much fuel you have left shouldn't be one of them.